JoSAA Counselling 2018 Schedule & Procedure: Joint Seat Allocation Authority (JoSAA) 2018 has announced the counseling schedule for JEE Main and Advanced categories. As per the announcement, the counseling will be done in 7 rounds. With the JoSAA Counseling students those have qualified in JEE Advanced can get admission into IITs/ NITs/IIITs/GFTIs. 1. 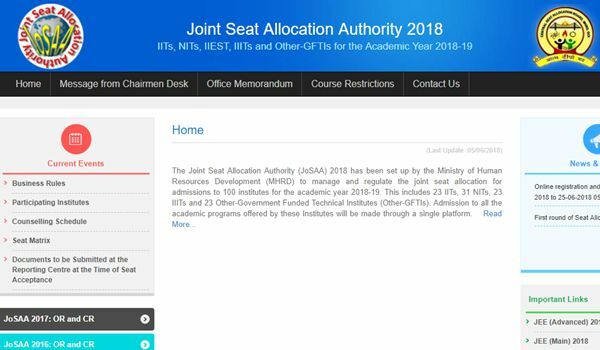 JoSAA 2018 Registration process is mandatory for any qualified candidate interested in joining any of the IITs, NITs, IIITs (Triple-I-Ts) and Other-GFTIs (within the purview of JoSAA 2018). The process of registration requires candidates to reconfirm a few basic details, viz. gender, state code of eligibility and nationality, and provide their contact details. 2. The number of days available for seat acceptance (along with document verification) in various rounds will be strictly adhered to. Candidates are advised to keep visiting http://josaa.nic.in for regular updates on schedule of events in case of any unexpected natural/National situations. 3. To accept allotted seats (and continue to be a part of JoSAA 2018 till the final round of seat allocation), candidates must pay seat acceptance fee, as per the details provided at http://josaa.nic.in and report at any reporting centre for document verification. During the scheduled period, reporting centres will be open from 10:00 hrs to 17:00 hrs. 4. Withdrawal option is NOT available after seat acceptance and document verification period of round 6 of seat allotment (i.e. no Withdrawal will be allowed after 17:00 hrs on 17th July 2018). 5. Physical reporting at admitting institutes is mandatory for students who have accepted a seat in NITs, IIITs (Triple-I-Ts) and Other-GFTIs immediately after 7th round of seat allocation (for further details visit CSAB website http://www.csab.nic.in). 6. Details regarding beginning of academic sessions at IITs, NITs, IIITs (Triple-I-Ts) and Other-GFTIs will be available along with other Institutional information (e.g fee structure etc.) at http://josaa.nic.in. 7. Delays or disruptions in service due to breakdown of JoSAA computer servers [due to reasons beyond the control of JoSAA 2018] shall be rectified as early as possible and notified on the web (http://www.jeeadv.ac.in OR http://josaa.nic.in). The decisions of JoSAA 2018 in this regard shall be final and binding.